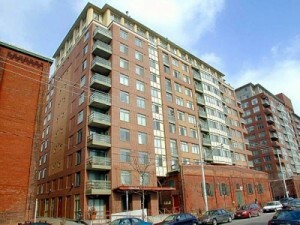 Don’t Miss Out On This Great Opportunity To Live In The Distillery District! A Spacious Corner Unit With Split Bedroom Plan. Gleaming Engineered Hardwood Flooring. Granite Countertops. Large Closet Adjacent To Kitchen Contains Washer/Dryer And Additional Ensuite Storage. Hallways And Lobby Are Being Refreshed This Spring! Restaurants, Shops, Theatre And Much More At Your Doorstep. Steps To TTC. Easy Access To The Gardiner And DVP. 2 bedrooms + den, 2 bathrooms.